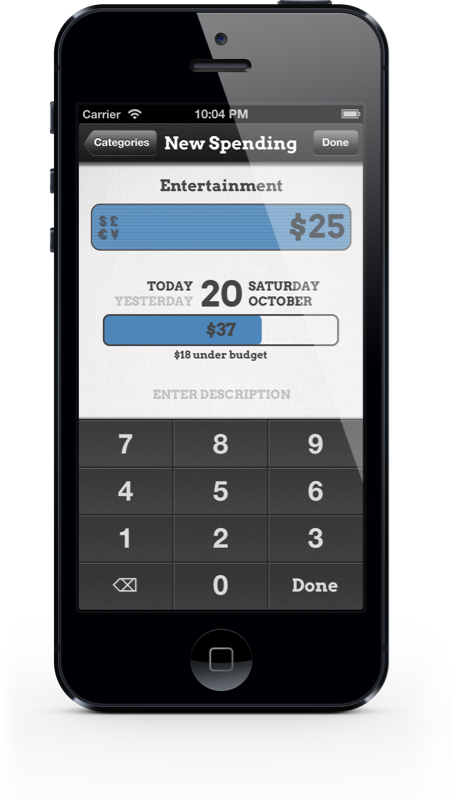 Spendalize is different than other budgeting apps. It is designed to be extremely fast, simple, and very good at showing you how you are spending your money. Spendalize tracks your daily spending decisions instead of your overall cash-flow, income or debt. As a result, Spendalize doesn't have features like multiple accounts or recurring transactions, because these things just get in the way of Spendalize's goal: to help you see and improve your spending habits. Pull out Spendalize and add an entry every time you decide to spend money. As you use Spendalize throughout the day, you'll become aware of how much you've been spending on day-to-day purchases. Reports on your spending are right there every time you open the app. 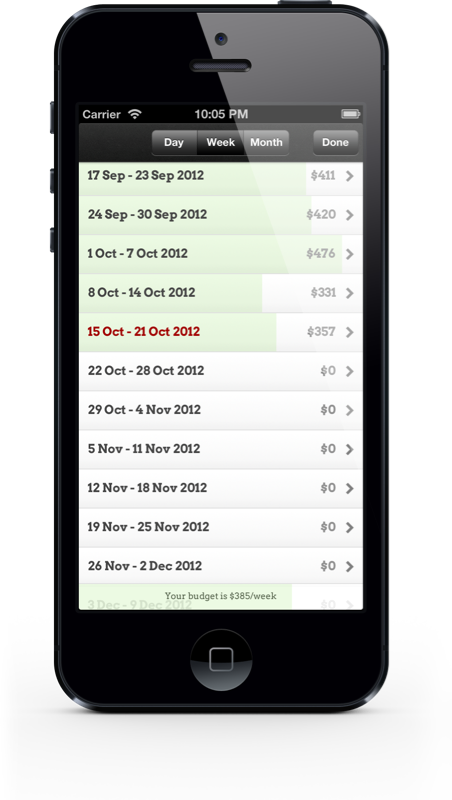 Keep your current budget app or spreadsheet to track your income, cash-flow and monthly expenses. 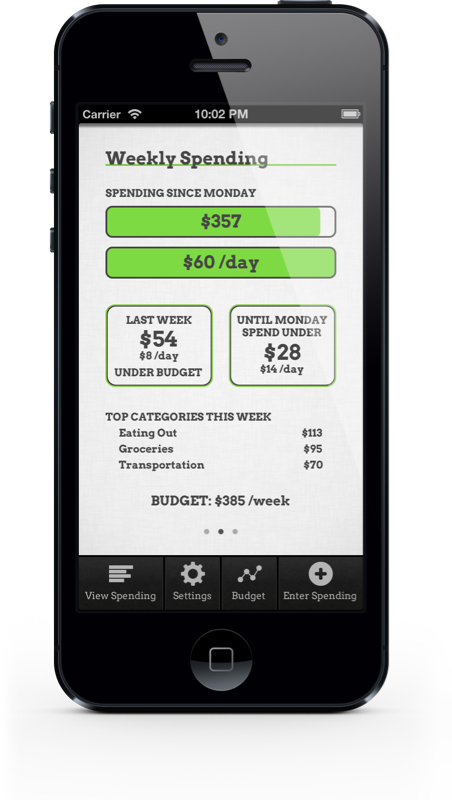 Use Spendalize to analyze your daily spending habits. Simple: Spendalize was designed to be simple and elegant. It foregoes many features other apps have, and focuses on making the features it does have enjoyable and easy to use. Upfront: There is no "Generate Reports" button buried in a menu - your reports are front and centre, so you're always seeing how much money you've been spending. Fast: Spendalize has been streamlined to make entering new spending extremely fast. You can enter a transaction from the main screen in as few as four taps. Detailed: Dig down into your data with interactive bar graphs. See how much you spent on any day, week or month, in any category. View, modify or delete existing records. Easy to set up: Use the budget calculator to get help setting your budget to an amount you can afford. Or look at your recent spending and move your budget up or down accordingly. International: You can set Spendalize to use one of over 25 different world currencies, and all amounts will be automatically converted and displayed in that currency. Individual purchases can be recorded in a different currency too, for internet purchases or quick trips over the border. Currency data is updated with a single tap. Safe: None of your data ever leaves your possession. All data is stored on your iPhone or iPod, and backups are emailed to you directly from your own email account. Internet access is *not* required for anything but updating currency data and emailing backups.